Image courtesy of British Museum under Creative Commons Attribution-NonCommercial-ShareAlike 4.0 International (CC BY-NC-SA 4.0) license. According to Wikipedia, the image said, “Take that!” or “Catch!”. I have to admit I was a bit skeptical. While Wikipedia isn’t as bad as people say it is, I’ve been fooled before (Turns out Rick Steves did not fight a bear in the woods. In my defense I was in early high school…). I did do some digging, and was able to confirm that Wikipedia is actually right this time. Check this out. 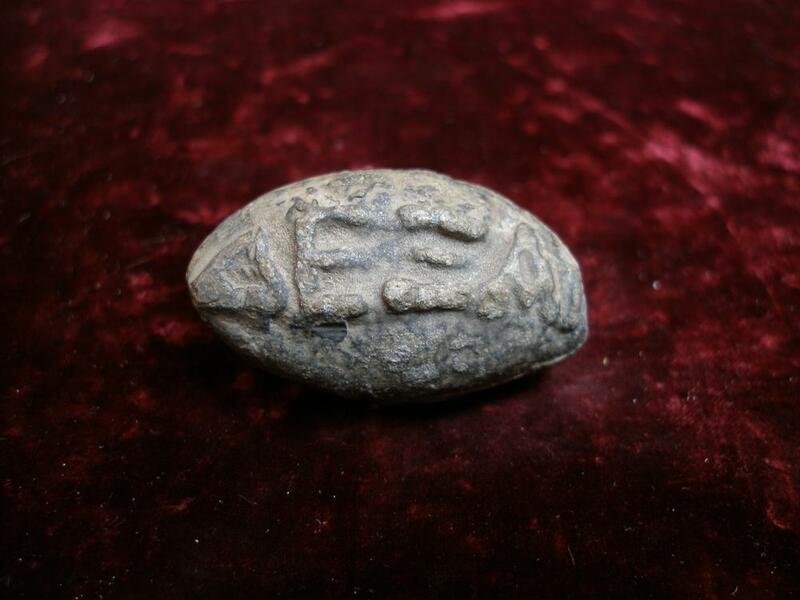 First off, the sling bullet says, in Ancient Greek, “ΔΕΞΑΙ” or “δέξαι” (Ancient Greek was written completely in what we would call capital letters, although the proper term is “majuscule”. “Lower case” (miniscule) Greek writing did not develop until the 9th and 10th centuries AD in the Byzantine Empire). My first step of digging was to confirm the translation. I used the wonderful Perseus Hopper word study tool. Perseus confirmed that “ΔΕΞΑΙ” is 2nd person singular aorist imperative middle of δέχομαι, meaning “take, accept, or receive”. Don’t worry if you’re not a linguist or grammarian. That basically means “ΔΕΞΑΙ” can be translated (literally) as, “[You] take!”, “[You] receive!”. So it is pretty acceptable to translate this as, “Take [this]!” I don’t know if I’d translate it as “Catch!” but I would agree that it’s in the spirit. (Translation is a tricky thing). My second step was to confirm that the image of the sling bullet was authentic. One of my colleagues is an actual Classicist (not a Johnnie Classicist like me), and he was curious where it came from. Fortunately the Wiki page provided a link to the British Museum, where the artifact is kept. It was excavated or acquired in 1851 from Athens. It is made of cast lead. I think the fact that it was cast is particularly interesting, because to me that suggests that “ΔΕΞΑΙ” was included in the mold. Did every bullet cast by this craftsman include “ΔΕΞΑΙ”? The artifact is dated to the 4th century BC (400 BC-301 BC), which is right in the Golden Age of Classical Greece. This time period starts just after the end of the Peloponnesian War (404 BC) and right around the time Socrates was executed in 399 BC. The 4th century includes the lifetimes of Plato, Aristotle, and Xenophon, the birth and death of Alexander the Great (d. 323 BC), which lead to the struggle for power known as the Wars of the Diadochi (starting 322 BC), leading to the reigns of his generals Ptolemy I Soter (founder of Ptolemaic dynasty in Egypt) and Seleucus I Nicator (founder of Seleucid Empire). So, that’s a lot of ground! Okay, so, I confirmed that the object was authentic and that the translation was accurate. What does this mean? What really struck me is that writing “Catch!” or “Take this!” is very much in the spirit of behaviors we have seen in modern warfare. 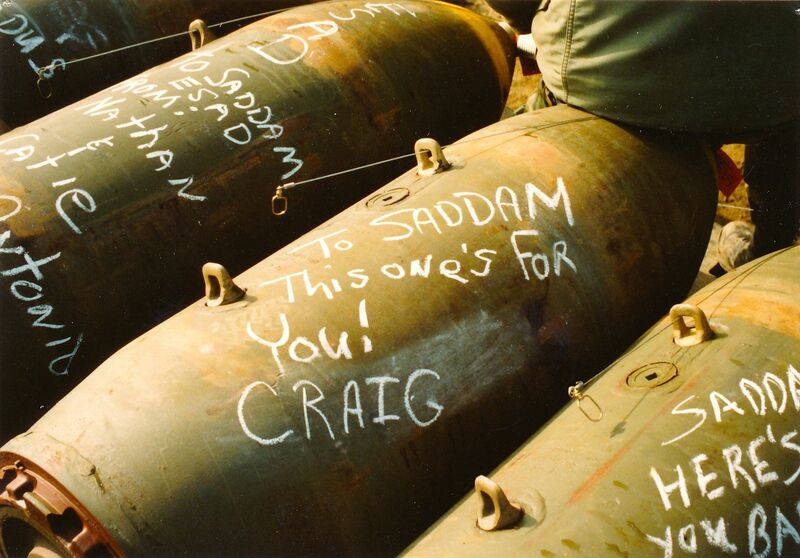 I’m sure you’ve all seen the images of soldiers writing on bombs during the 20th century, especially during World War II. Here’s a more recent example.